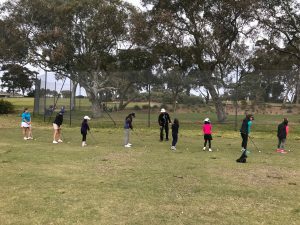 Eight girls, aged 8 to 15, gathered together on Tuesday, 25th to participate in the first Woodlands Golf Par-Tee for girls. Arriving at 9.30 the girls met each other and were taken through a series of golfing games with Steve and Cat. Then they formed pairs – an older girl with a younger one – and played down the first and second fairways in Foursomes format. The club then put on lunch for them – Party food and drink. It seemed that all the girls enjoyed their day and we hope that they will get to know each other well enough to form a tight group here at Woodlands. Would you believe there are about 15 girls learning and playing golf at Woodlands at the moment, so the future could be very bright for us all.